We’ve been working on our website lately to bring you more ways to find inspiration for the kitchen of your dreams. While we’ve always provided easy navigation to kitchen ranges by style – Modern, Traditional and Contemporary – we’ve realised that people don’t always know what style they want but they often know that they want a particular colour. Whether that be a neutral white or cream, something bolder or natural wood, often that can be the starting point and the style can come later. We’ve also created an extra gallery that shows how these colours can be combined for maximum effect in our Colour Combinations gallery. 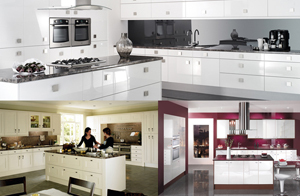 Each colour gallery features kitchens from modern, contemporary and traditional styles so it’s great as a starting point if you know that you want a white kitchen, for example, but then run out of inspiration. We’ve also taken the opportunity to improve the blog area of the website as well. Where previously you could only see the posts from that particular month, you can now view the headings for all previous updates. We’ve also created categories so you can easily browse through the Offers and Competitions or the Monthly Foodie Blogs or look at everything related to Kitchen Design. There’s a blog feed now on the home page and within each post we have added share icons so it’s easier than ever to share on your favourite social media platforms. We hope you like the improvements. Please let us know what you think! 0 Responses to "Pick a Colour, Any Colour..."